We’ve all heard the old adage about the challenges of trying to get a square peg into a round hole, but architects can face similar dilemmas where it comes to planning staircases. If your home is on more than one floor, you’re going to need stairs – even if you live in a tiny space. The challenge here is for architects to think big about small spaces – and that’s exactly what we’re good at. 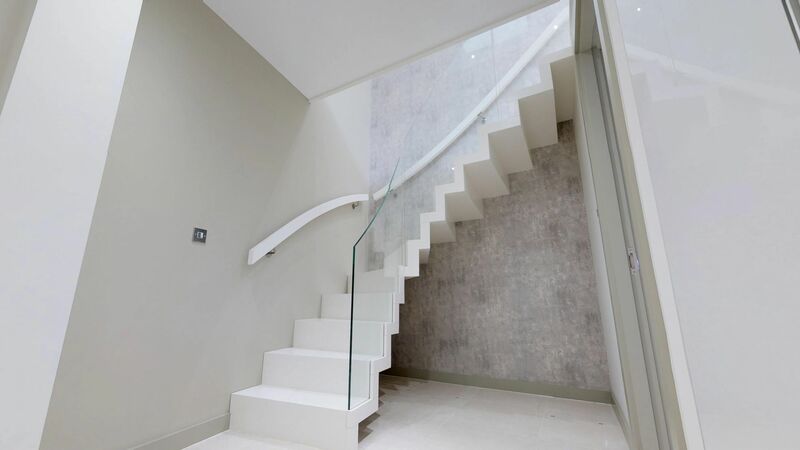 Seeing the potential and creative scope of a small living space is something we’re experts at, and if you have a small space, our magnificent range of staircases can create an impressive illusion of space in your home. We’re going to encourage you to let your imagination go a little wild and consider that stairs are more than just a mechanism for getting you from one floor to another. They should be considered as a vehicle for making a real statement and you can really wow your friends with making a bold and dramatic declaration of style, even in the smallest of spaces. We’ve rounded up some suggestions that will generate an airy and floating sensation for even the most grounded of you, and an unquestionable sense of freedom if your space was previously making you feel hemmed-in or claustrophobic. If you integrate your choice of staircase design with canny home decorating ideas, you’ll be on to a winner. 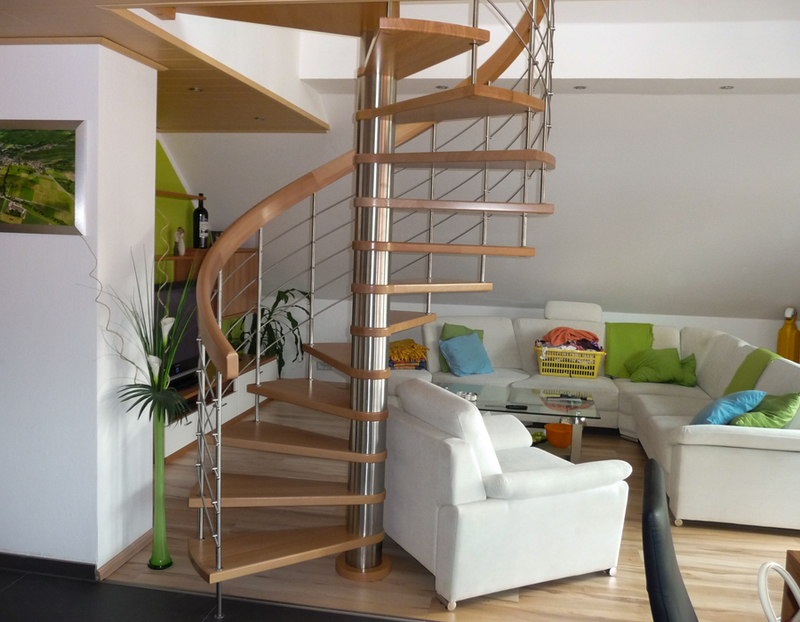 You can choose our exquisite, freestanding lacquered spiral beech stairs with stainless steel railings. Which simply scream ‘spaciousness’ and ‘swoosh’. The movement in the design creates this uplifting sensation – which doubles in actuality when you climb them to the next level of your home. 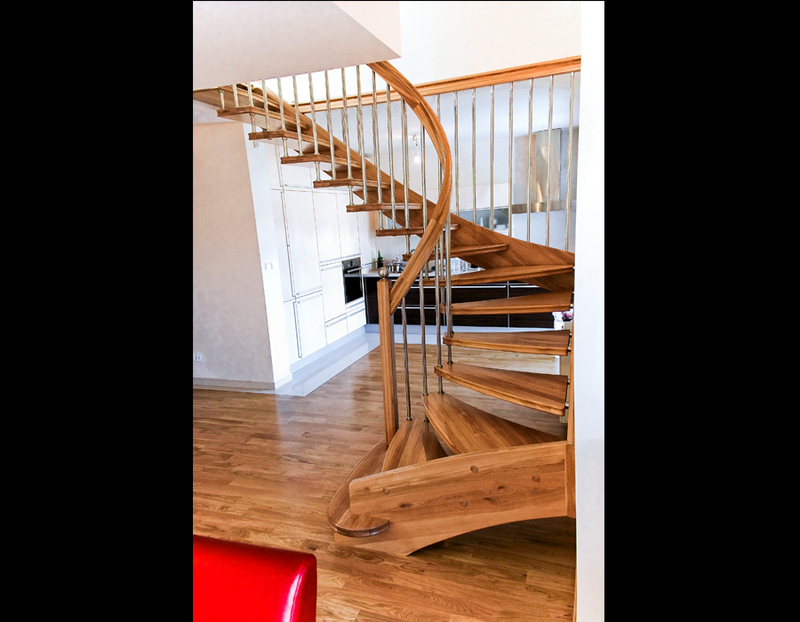 We also do a fabulous range for awkward shaped spaces, such as our lacquered suspended oak stairs with SM1 spindles. These have a more angular spiral ascent, where the external stair string is fixed firmly to the wall. Again, a sense of movement is achieved from the design, through the configuration of the highly polished bannister and stainless-steel spindles. While in our photo the wall is painted a warm, cream colour, just imagine what the rich, almost orange colour of the oak would look like if the wall was painted a lush blue! That would be a statement of the years as the staircase would appear to be falling backwards in space, reinforcing the natural movement of its design. Another solution is to choose a smaller, steeper staircase such as our stained suspended beech stairs with SM1 spindles and LED lights. Here, common to many of our designs, the slatted stair design where you can see through the gaps in the stairs creates the illusions of space, as your eye’s range is longer, and your view is uninterrupted by where the down-drop of a more conventional staircase would normally be. 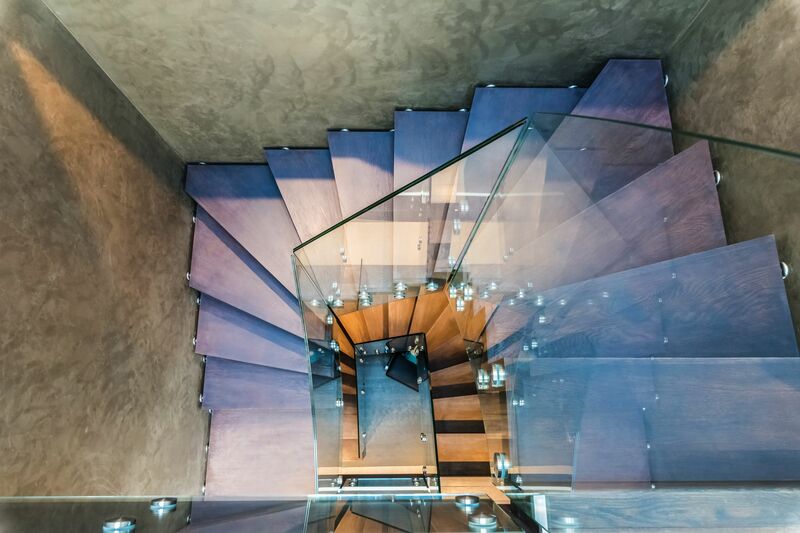 Moreover, the slightly steeper than normal stairwell benefits from the lighting – not only is it stylish but creates an additional safety factor, lighting your way to the rooms above. Our floating zigzag staircase in white painted birch hardwood with glass creates a fabulous optical illusion of a ‘disappearing staircase’, with its glass baluster effectively making the stairwell vanish into the wall beyond it. Obviously, this only works, if you keep your paintwork the same colour as the stairs – selecting a shade of bright pink, would defeat the object! 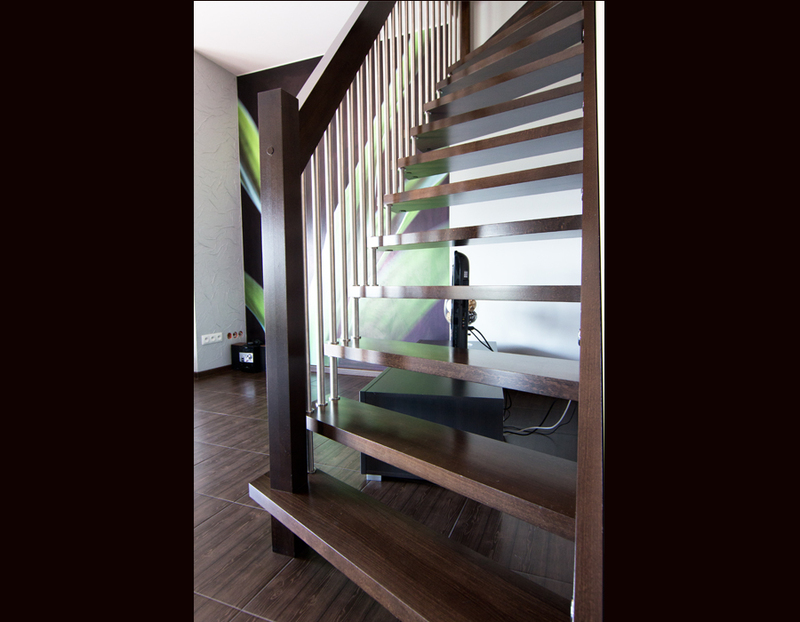 This effect is also achieved by our solid stained oak zigzag, which has a glass baluster, but the colour of the oak in this instance will give you the scope to be a little more adventurous in your decorative colour scheme on the walls in order to achieve the disappearing staircase effect. Fitting stairs in a small space is tricky. Every millimetre matters in order to achieve not only the safe and compliant staircase but to enhance the hallway décor and provide a focal point with a wow-factor. And that’s precisely why you should take full advantage of our ability to make bespoke wooden stairs for you. 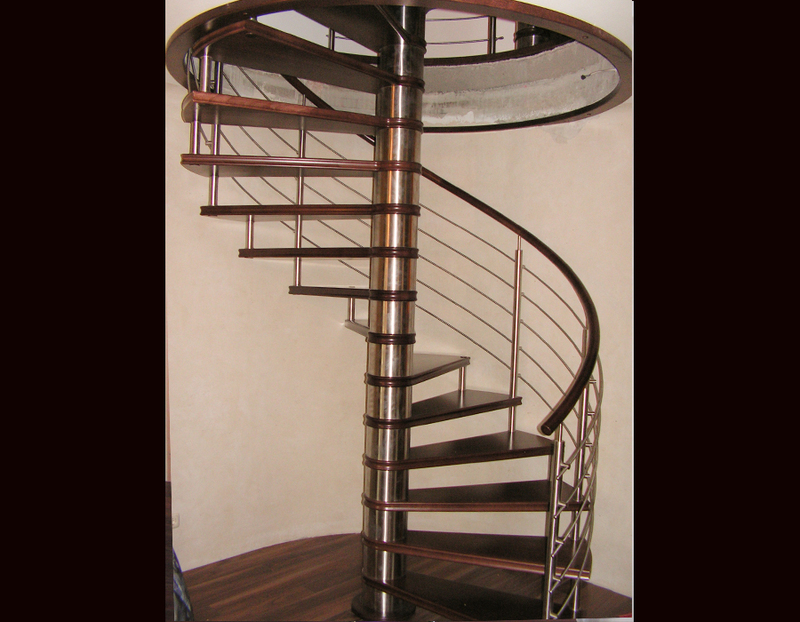 Our friendly team is comprised of highly skilled craftsmen with more than 20 years’ experience producing unique, high-quality staircases. 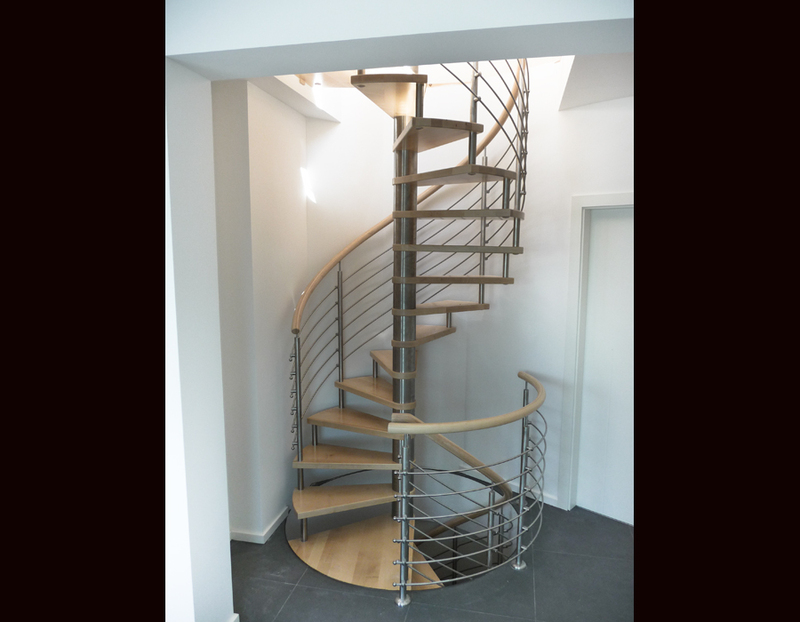 Our designers and Customer Service team are experts in finding stair-solutions to suit individual properties. Another space-saving approach is to make the most of the space under your stairs. Get started on your space-saving revamp now!